Title agent market production increased 7.6 percent this past quarter as compared with a year ago. Title agents are forecasting residential price growth of 5 percent for the year ahead. Title agents surveyed remain optimistic about transaction volumes, with a 7.2 percent increase in optimism over a year ago. The three-month average for non-distressed properties dropped to $302,600 in September from $310,100 in August. The three-month moving average sales-to-list-price ratio was 98.0 percent in September, down from 98.6 percent in August. The first-time homebuyer share of purchases in September was 34.8 percent. Existing-home sales were up 3.2 percent in September month-over-month. This was propelled by a 34-percent share of first-time buyers. 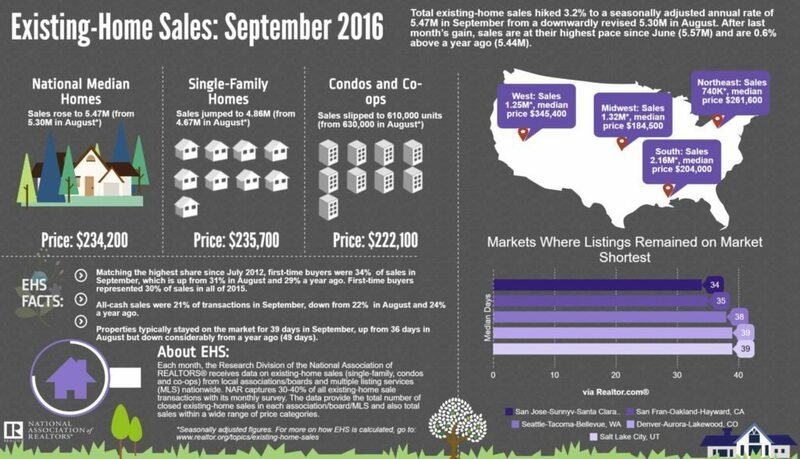 The median existing-home price for all housing types in September was $234,200.